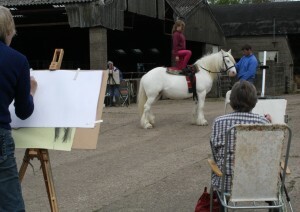 Yesterday’s equestrian life drawing session was a great success. 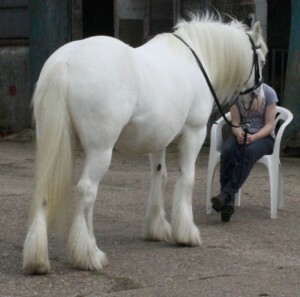 The setting was lovely, the horse behaved beautifully and the sun even shone. 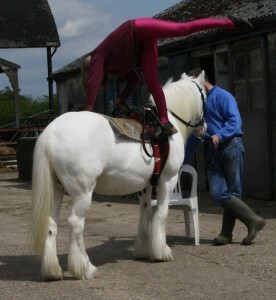 We are extremely grateful to Polo the horse, Martin who owns the farm and who made the day possible for us, and to his daughter Lily who held Polo still and who even performed some inspiring horseback gymnastics. As you can see from the photos, Polo was perfect to draw, having well-defined muscle structure. I know how difficult it is to get such a horse to look white. Lily certainly went to great trouble to get Polo looking splendid for us. Ten artists set up easels around Polo, our model. 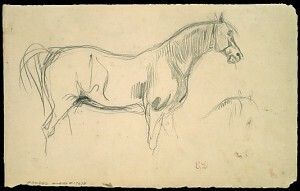 Working in a variety of media including charcoal, chalk, watercolour, Neocolour wax pastels and graphite, they drew the horse from differ ent angles. After warm-up exercises using continuous line drawing, I suggested working tonally and really looking at the clearly-defined planes and masses on this horse. In her conformation, she does remind me of the horse in Ruben’s “Rear View” study (right). Though she kept her forelimbs very still, Polo had to shift the weight from one hindlimb to the other every ten minutes or so. The best trick seemed to be to have two pictures on the go at once, one with her resting her left hind and the other with her resting her right hind leg. It was then possible to move from one picture to the other when the weight shifted. Lily, who had been patiently holding the horse for us all morning, couldn’t resist changing into her vaulting gear and jumping on. 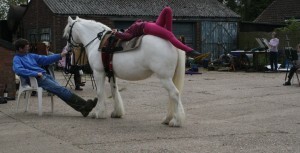 She is a very experienced and successful equestrian vaulter and held these positions absolutely still. 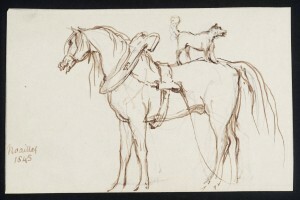 It was a rare and unexpected treat for the group to have the chance to draw an acrobat balancing on a horse! Lily was able to hold horseback poses beautifully for several minutes at a time. At the end of the day, Martin gave us a tour of the farm, walking us through fields of glossy cattle, past pollarded woodland and land set aside to encourage wildlife. He was proud to point out mixed-species hedges that he had planted, and talked to us about the numerous birds and wild-flowers that thrive on this land. All in all this was a very interesting and successful day. 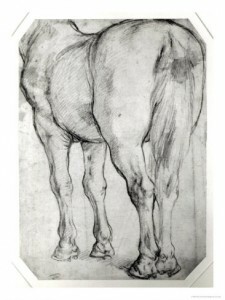 I have another horse life drawing workshop planned for Sunday June 17 (same venue). Click on “Contact”, above, to book your place.